Born and raised in India, Ritika is a graduate of BITS Pilani, India. She worked as a Business Analyst at Goldman Sachs for three years, gaining expertise in data analytics and project management skills. She is an amateur marathon runner and cyclist, which has transformed her outlook towards life, nature and mindful living. She has participated twice in a 100km trail-walk while raising funds for Oxfam India. 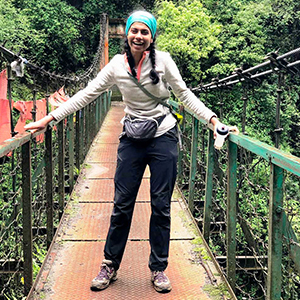 Being a serious nature lover and fitness enthusiast, Ritika finds hiking as a therapeutic experience in today’s world of chaos and constant stimulation. She has completed multiple high-altitude treks in Himalayan range. Ritika’s relentless desire for a career with social impact has led her to Amani’s Social Innovation Management program. Her vision is a future with healthy sustainable living for the entire global community.